If we could provide access to Wikipedia with simple GSM (SMS, audio) mobile phones, we would make a major step to the direction of Jimmy Wales’ vision: “…every single person on the planet…”. In the MobilED initiative we are working on this direction. We are right now implementing an experimental audio encyclopaedia that makes it possible to search articles in a mediawiki server with SMS message. The server then calls you back and a speech synthesizer reads for you the article found from the database. To be a wiki one should have a possibility to contribute to the server, as well. To do this we have a way to dictate your story to the mediawiki server. The recording will then be available for other callers and online users of the mediawiki. We have made a video mock-up that explains the concept in 3 minutes. Have a look of the Audio Encyclopaedia in informal learning -video ((MP4, 9.1M). We would love to hear your comment about the concept to improve it. 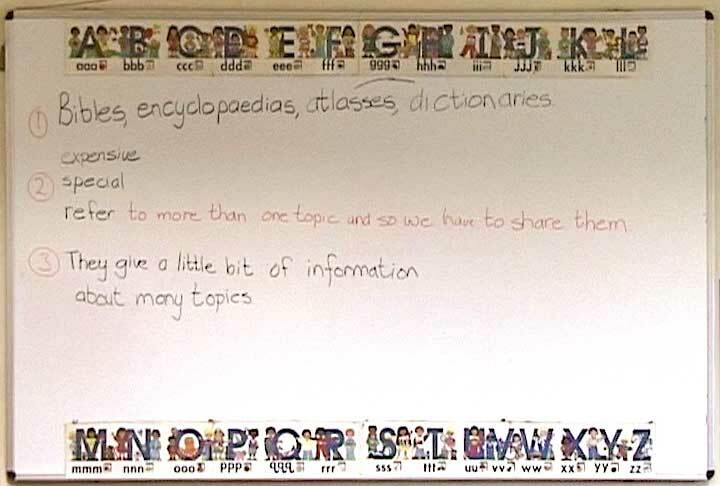 PS about the image: When I was first time visiting the Cornwall Hill College in Pretoria, SA I notice that in some class there must have been discussion about encyclopaedias. The picture is about classroom whiteboard. I really like the parts stating: “encyclopaedias are expensive …. so we have to share them …”. Next Post Don’t allow software patents to threaten technology enhanced learning in Europe!